I really enjoyed Visage from the time I first heard them on WPRK-FM in early 1981. The seminal cut “Fade To Grey” was played and since I was already primed by the recent acquisition of Ultravox’s “Vienna,” I was already clued into the existence of this ‘Vox side project, which actually predated the “Vienna” album. “Fade To Grey” pushed all of my eurosynth buttons, which were still forming at the time so I wasted no time in acquiring the album ASAP. Billy Currie and Midge Ure, who were at that time one half of the current Ultravox lineup, formed the group nexus along with 60% of Magazine: Barry Adamson, Dave Formula, and John McGeoch. I was already a Magazine fan having purchased their “Correct Use Of Soap” album. Ex-Rich Kids drummer Rusty Egan was present and accounted for and narcissistic dandy Steve Strange “fronted” the whole shebang. Whatever one thought of Strange and his limited singing, the musicianship in Visage actually made it a New Wave supergroup of its time. The conceit was to make dance music that was actually good moving on from the usual Roxy/Bowie influences tailor made for the burgeoning New Romantic club scene of the time, which many members of Visage were directly responsible for. I bought Visage records for a few years but was flabbergasted to see that in 1983, just three years after the group’s debut and with two albums under their belt, there was a “greatest hits” album being flogged. But since they salted the pot with mixes and unreleased material, I went for it. The US edition came out first and it had the super John Luongo remix of “Fade To Grey” from this US EP [see left] that I had bought when it was released in the summer of 1981. I didn’t find out for decades later that this was a US exclusive remix for many years. It sure wipes the floor with the timid UK extended version. 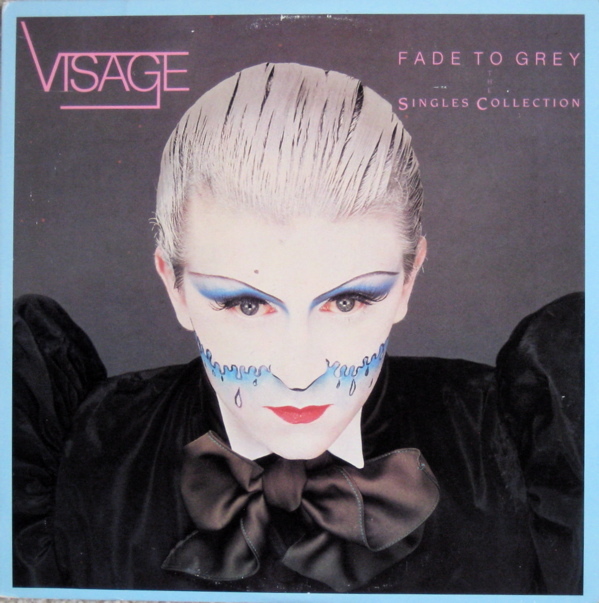 “Mind Of A Toy” and “Visage” were UK singles, present here in their single edits. 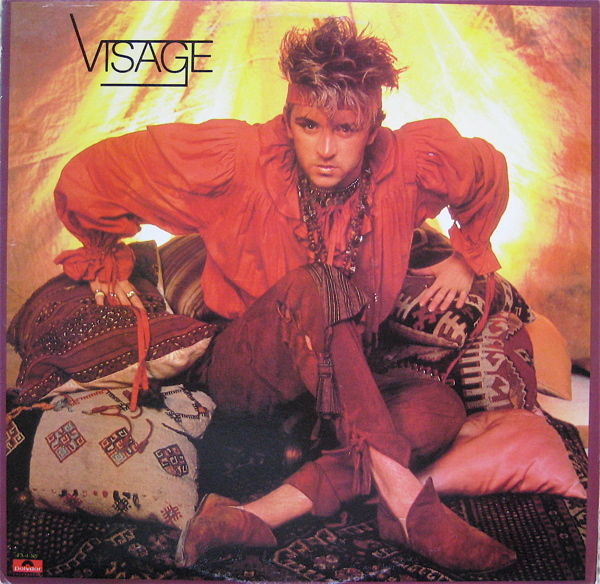 “Visage” in particular was always an incredible track from the debut album which I never tire of hearing. The arrangement on that is endlessly stimulating with the perfect blend of synths and guitars by four of the best in their field. “We Move” is here in an edited mix; having previously appeared on the US “Visage” EP previously mentioned. At the time, I assumed that it was an import B-side but it was released on the EP first. Side two opened up with the best bait the album had to offer for someone who had all of the previous Visage records; the band’s early demo cover of Zager + Evans’ “In The Year 2525″ as rendered with a palette of more appropriate synths and drumboxes. The LP listed this track as having been mixed by John Hudson for release. Make a note of that. We’ll return to this thread later. Side two then had had lots of UK 7” mixes; “The Anvil” from the B-side of “Pleasure Boys.” The “Night Train” 7″ remix, and the 7″ edit of “Pleasure Boys.” Since I tended to buy 12″ singles over their 7″ brethren, this was pretty good value for my ears. At the time, my 12″ of “Pleasure Boys” was broken when the car I was riding in from buying the disc stopped suddenly to avoid splattering a squirrel and goods suddenly shifted in the back seat. The disc was broken before I ever got a chance to hear it. It would be several years before I would finally get another copy, but with full karmic repayment. The clerk in the [local chain] store neglected to charge me for the disc out of the stack I purchased that night. When I went in the store the next day to point this out to the clerk, the manager said not to worry about it. Finally, the album wraps up with my perennial fave rave Visage track, “The Damned Don’t Cry,” my pick for the quintessence of whatever the hell the New Romantic movement was allegedly about. For me it wrapped up European melodies: check. Synthesizers: check. Minor key melodicism: check. And finally, a palpable sense of ennui expressed in the music: check. The cut was the 7″ edit, minus the extended middle eight of the LP cut. Next: We’ll take a close look at the several variants of this title that trickled out over a decade. This entry was posted in Core Collection, New Romantic and tagged Barry Adamson, Bily Currie, Dave Formula, John McGeoch, Midge Ure, New Romantic, Steve Strange, Ultravox, Visage. Bookmark the permalink. Visage were one of those projects which enticed me and also aggravated me. The first album is brilliant and the blueprint for what woud be the New Romantic movement in music. The diversity and calibre of the muscians is really quite mind boggling. Steve Strange was a perfect fop to place upfront and Rusty Egan gave the band the London Club cred the project needed. The second album may not have been as immediate or sounded as new as the first but it still ran rings around some of the work the the then bloated New Romantic scene was producing. By album three it was really just a Steve Strange vehicle, who with a couple years, would be picking pockets in London Nightclub to pay for drinks and his growing smack habit. That album is saved by Gary Barnacle and some smart session muscians being brought it, but the ideas were thin. The wonderful thing about the debut album is that it forshadowed so much music that would follow it – or come out around it since Polydor chose to delay it’s release. I am now busy working on a new playlist…I’m calling it Proof of Concept/Stream of Consciousness….more when its complete. Echorich – Midge Ure read Rod the riot act when as musical director for several Prince’s Trust concerts he ran afoul of Rod The Mod’s star fits. The blunt Glaswegian had no time for his ego and told him so in no uncertain terms. Apart from the good cop/bad cop duo managers of the Bee Gees, no other actual musicians gave him any grief, no matter how famous they might have been. The first thing that hit me about “The Anvil” in early ’82 was how it ran parallel to what Ultravox were doing on RiE. An astute observation (I mean the Anvil/Rage in Eden connection). I always wondered why The Anvil always drew me back to itself even though the first album was the more “classic.” I’ve definitely been … not obsessed but fascinated, I guess … with Rage in Eden for, well 30+ years now!